EM Polycoated bullets are coated with the highest performing polymer on the market today. They're designed to prevent leading, eliminate smoke, keep your bore clean, and deliver exceptional match grade accuracy. Get discounts, hear about sales, new products, and more! Orders are currently being filled in 5-7 business days. Located near Colorado Springs, Colorado? Find us at local matches and gun shows, contact us by phone (719) 357-9508, or E-mail us about picking up your package in person to save on shipping! We are working on compiling load data for all of our projectiles. 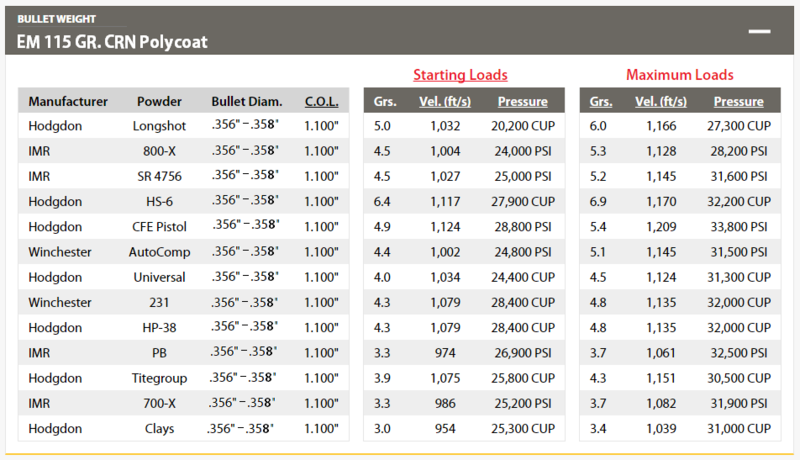 ​9mm, .40 S&W, and .45 ACP data is now available in the Load Data tab at the top of the page. Figuring out what size bullet you should use is a question we hear a lot! ​Find out how to select the perfect bullet for your particular gun here!